To reduce noise pollution of the neighbouring area, the beginning of the local traffic including sporting flying equipment opetation is at 0800 (0700), the end at 1800 (1700). Outside these hours only urgent arrivals from outside of ATZ to AD and departures from AD to outside of ATZ are allowed. Unless necessary, especially for departures and landings, carry out any activities in ATZ above 1000 ft/300 m AGL. Possible mass paragliding and hanggliding traffic in ATZ and its vicinity. TMA II OSTRAVA with vertical extent from 4000 ft AMSL to FL 95 is situated westward from LKFR. Caution is advised during take-off, landing and taxiing due to unauthorized people crossing RWY 08/26 in the treshold and clearway area as well as at the southern edge of the RWY strip. Aeroklub Frýdlant nad Ostravicí, z.s. 1.2RWY is unserviceable after prolonged rains. RWY 26 left and right hand traffic circuits. 1.3.1The traffic circuit altitude is 2420 ft/737 m AMSL. 1.4.1Possible mass paragliding and hanggliding traffic in ATZ and its vicinity. 1.4.2Caution is advised during take-off, landing and taxiing due to unauthorized people crossing RWY 08/26 in the treshold and clearway area as well as at the southern edge of the RWY strip. 1.4.3Take-offs of gliders towing by a winch are carried out from the glider strip adjacent to the northern edge of the RWY. 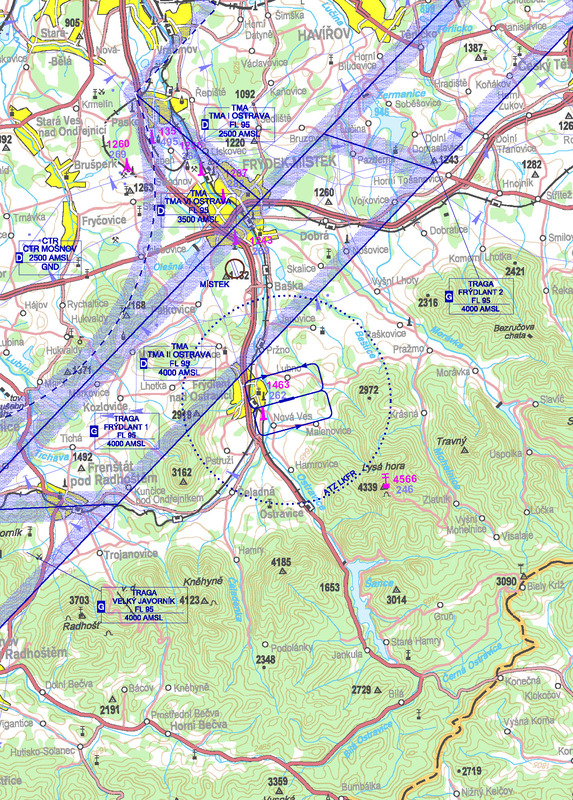 1.4.4TMA II OSTRAVA with vertical extent from 4000 ft AMSL to FL 95 is situated westward from LKFR. 1.4.5Parking of aircraft always along the southern edge of the RWY strip according to instruction of officer of Providing information to known traffic. Aircraft shall be parked so that when the engine is started, the induced vortex does not affect stand of Providing information to known traffic nor the sightseeing terrace for visitors at aerodrome snack-bar. 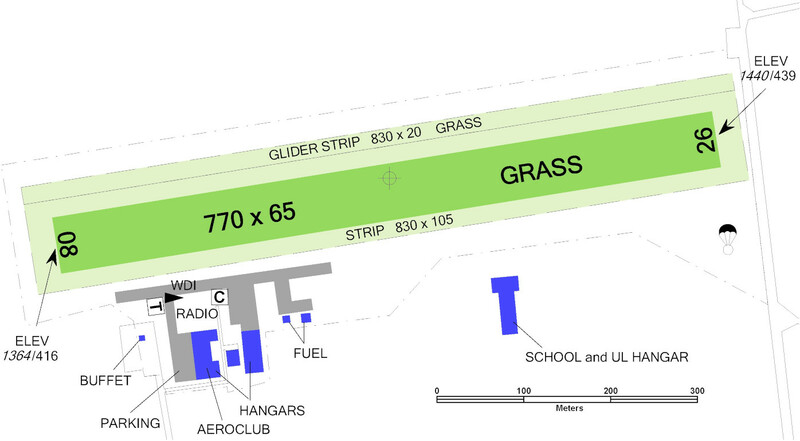 At the hangar area of ultralight aircraft aviation school, individual ultra-light planes shall be parked in front of the hangar of ultralight aircraft or along southern edge of the RWY strip in such a way that a space at least 30 m wide between the RWY edge and the parked planes remains clear for taxiing. 1.5.1To reduce noise pollution of the neighbouring area, the beginning of the local traffic including sporting flying equipment opetation is at 0800 (0700), the end at 1800 (1700). Outside these hours only urgent arrivals from outside of ATZ to AD and departures from AD to outside of ATZ are allowed. After reaching 50 ft (15 m) above the altitude of the end of TORA, make left turn (direction Celadna), bank less than 15°. The turn shall never be commenced before passing the RWY THR to be avoided overflying of built-up area situated southward of THR RWY 08. After reaching 50 ft (15 m) above the altitude of the end of TORA, make right turn, bank less than 15°, not to cross the Ostravice river, if possible. To complete the turn, take heading approximately 030°, continue climbing to the cruising level. 1.5.3.1To minimize noise disturbance above the town, especially when landing RWY 08, sufficient height is necessary so that for final approach after base leg minimum engine power is applied without the need of flying at low heights above built-up areas of the town with engine on high power. 1.5.3.2The road in the vicinity of THR RWY 26 shall be overflown due to safety at least 15 m from the lowest part of the aircraft or towed object. 1.5.5Any of these procedures do not acquit a pilot of his duties and rights, resulting from the obligatory regulations. Safe execution of flight is priority. Published noise abatement procedures are obligatory for aerotow flights. In case the procedures cannot be adhered to with regard to the type of the towing aircraft and the towed glider or meterological conditions, the aerotow traffic from RWY 26 shall be reduced to unavoidable minimum (departures etc. ), eventully shall not be carried out at all. 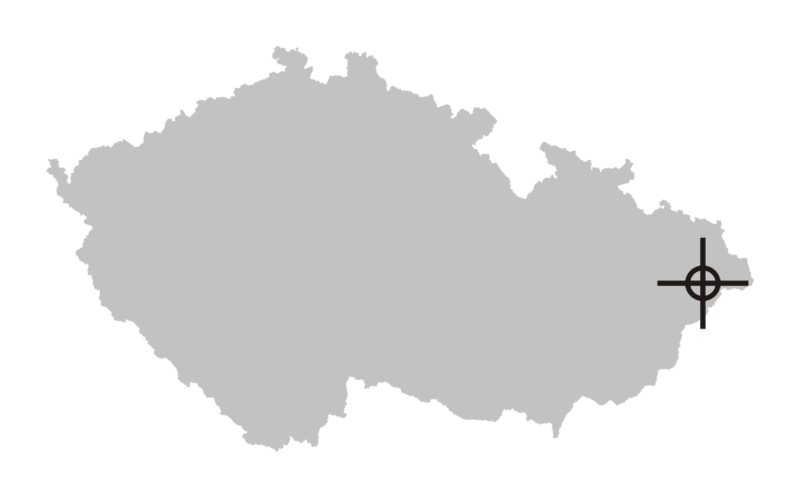 2.1Providing information to known traffic in Czech language only. 2.2A charge for Providing information to known traffic on request outside of operational hours is 300 CZK/hour.